We, the undersigned civil society organizations, Vietnamese citizens and those of Vietnamese origin living abroad, would like to reiterate what the Special Rapporteurs on Freedom of Expression and Freedom of Religion or Belief, as well as the Working Group on Arbitrary Detention have stated in their recent reports. 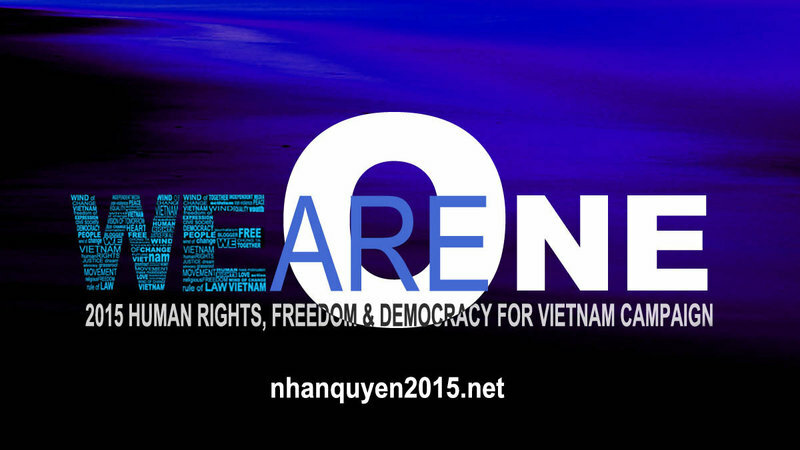 Since Vietnam became a member state of the Human Rights Council in January 2014, human rights abuses committed by the State continue despite the recommendations of the Council and the UN human rights mechanisms. Vietnam’s Deputy Minister of Foreign Affairs Nguyen Quoc Cuong is leading a Vietnamese delegation to participate in the UN Human Rights Council’s 28th session, which takes place from March 2 to 27. Both the Special Rapporteur on Freedom of Expression and Freedom of Religion or Belief, and the Special Rapporteur on Cultural Rights are presenting their reports on Vietnam at the current Council sessions. We therefore call upon member and observer States to consider the rapporteurs’ report findings and recommendations and question the government of Vietnam on its failure to uphold its responsibilities and obligations pursuant to the human rights treaties to which Vietnam is a State Party, including the International Covenant on Civil and Political Rights (ICCPR), International Covenant on Economic, Social and Cultural Rights (ICESCR), and the Universal Declaration of Human Rights. We also respectfully ask the Council to specifically monitor efforts and progress by Vietnam in addressing and complying with the recommendations made by Special Rapporteurs, Treaty Bodies, and UN member states at the Universal Periodic Review. If there are no measureable improvements when Vietnam’s 2014-2016 tenure in the Human Rights Council is up for re-election, we urge member states to vote against Vietnam based on its continuing rampant human rights violations. It is time for the Vietnamese government to learn that it can no longer escape accountability. 1) We will petition for signatures of support for our open letter to the UN Human Rights Council, ambassadors to the UN, and embassies in Vietnam, and we will submit it to the UN Human Rights Council and its mechanisms, and all stakeholders. Repeal Articles 79, 88, and 258 of the Penal Code which violate Vietnam’s Constitution and international human rights law. 3) Delegations will be formed in various cities to meet with ambassadors, UN officials, local government officials, and staff of international human rights organizations to urge them to support our cause by putting human rights protection at the forefront and as preconditions in all trade agreements and diplomatic relations with the Vietnamese government. 4) The above actions will be carried out throughout the year of 2015 with a Rally for Vietnam’s Human Rights taking place on December 10, 2015, International Human Rights Day. On this day, Vietnamese in both Vietnam and abroad will show solidarity in white shirts and will take to the streets peacefully advocating for Freedom, Democracy and Human Rights for Vietnam. i) Should we be subjected to any abuse, attacks, crackdowns, imprisonment, enforced disappearances etc. at the hands of the State, merely because we exercise our rights to free expression and peaceful assembly, we earnestly ask that you take this as another live testament of the Vietnamese government’s continuing abuse of its citizens’ human rights. This is unbecoming of a member state of the UN Human Rights Council, which should “uphold the highest standards in the promotion and protection of human rights” and of a co-coordinator of the Association of Southeast Asian Nations (ASEAN) at the inter-governmental body. We also ask that when it is time for the UN Human Rights Council’s next membership election, Vietnam receives a loud and clear message from your votes that it must bear responsibility for its blatant violation of international human rights law and standards. We also respectfully ask that during our imprisonment, UN Special Rapporteurs and embassies’ staff in Vietnam request to visit us and other existing prisoners of conscience, human rights activists in prisons, and advocate for our freedom. ii) If it is because of our open letter forewarning the free world and the United Nations Human Rights Council of our human rights campaign for 2015 that the Vietnamese government refrains from cracking down on our peaceful assembly, hunger strikes, and peaceful criticism of issues of public concern, please kindly view the State’s inaction as a strong confirmation of the important and effective role of the international human rights organizations and the UN Human Rights mechanisms in protecting human rights under dictatorial regimes. Crimes persist only in the dark. Once you expose the State’s abuse of human rights and with the world watching, you can help save our lives and restore our rights. We trust that universal human rights will prevail in every corner of the world, including our homeland, Vietnam, in 2015.